We sat outside on the lower deck periodically lifting our feet as the waves crashed over the side of the boat. 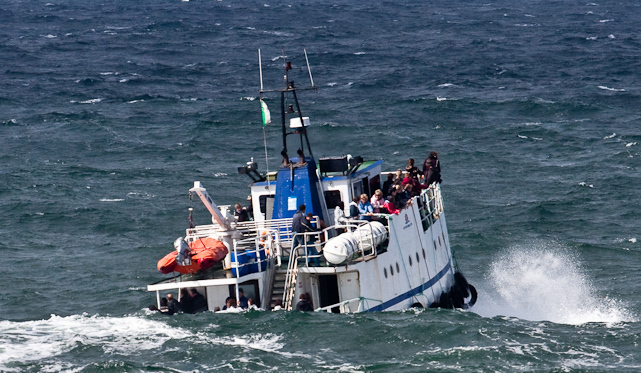 It was a characteristically rough ride as the Doolin passenger ferry navigated the choppy waters of the Atlantic. Mia and I were headed to the closest and smallest of the Aran Islands. Not a popular tourist destination, Inis Oírr would offer a quiet walk among the many stone walled fields to a holy well and some lovely conversation with the islanders. The woman sitting next to us and clinging to the bench was headed to the farthest, biggest, and most touristed island. She was surprised at and a bit disdainful of our choice not to visit Inis Mór with it’s iconic historic sites. And massive crowds. At least 1,000 each day on just one boat from one ferry terminal. Our new friend and her husband were spending a week in Ireland and following the popularly accepted clock-wise coastal itinerary beginning and ending in Dublin. They were doing their best to see as many sites as possible but with only a week…well, they just had to move fast. Dublin: Trinity College, Book of Kells, Guinness Brewery. Check. Wicklow Mountains. Check. Waterford Crystal factory. Check. Kiss the Blarney Stone. Check. Ring of Kerry. Check. Cliffs of Moher. Check. Dún Aonghasa on Inis Mór. Check. You get the idea. After her initial amazement that we were spending two weeks in only a small area of western Ireland she asked where we were staying. I told her just outside Galway City. “Oh,” she responded. “We had dinner there one night. So I guess we can say we’ve done Galway.” Check. My head snapped around to look at her. She was serious. Really!?! Talking with a heritage guide at Loughcrew two weeks later, she mentioned that so many visitors to the Boyne Valley Visitor Center, when offered tours to Knowth as well as Newgrange, just slap their money on the ticket counter and say, “No, just the big one.” The Big One. Check.